The memorial was completed and officially dedicated in October of 2011. 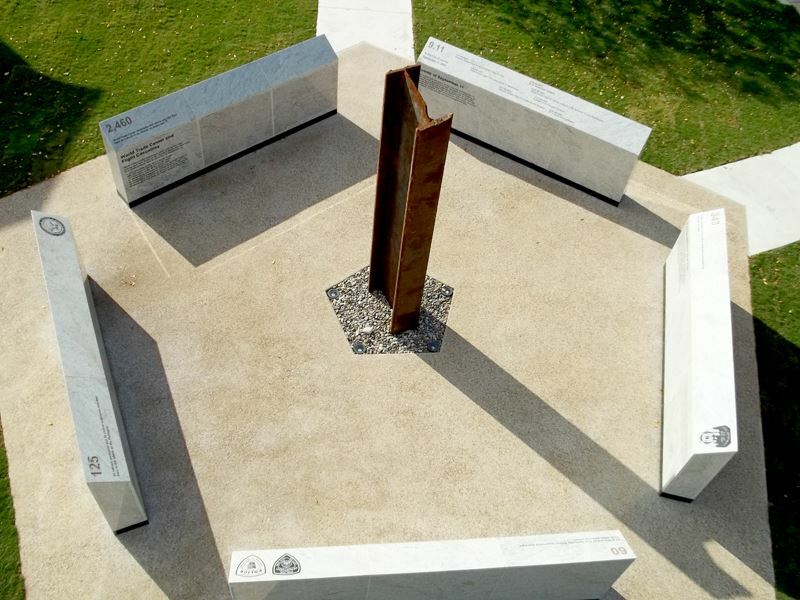 In TownCenter Park, more than 1,500 miles from where the two towers of the World Trade Center (WTC) once stood, the City of Kennedale's September 11, 2001 Memorial features a 12-foot steel beam acquired through the World Trade Center Artifact Program. The beam (identified as H-0118), which was originally in the World Trade Center, was given to the City of Kennedale by the Port Authority of New York and New Jersey. The five walls surrounding the beam form the shape of The Pentagon Building in Washington, and one of the walls is engraved with a timeline detailing the events of September 11th, 2001. On the anniversary, the memorial is engineered to act as a sundial, with the shadow of the beam crossing over the events as they happened. The time between the first strike and the collapse of both towers was just one hour and 42 minutes. WALL ONE is a timeline of the events of September 11, 2001. Each year, on the anniversary, the shadow cast by the steel beam acts as a sundial, moving across the events as they occurred. WALL TWO is dedicated to the 343 Fire Department New York (FDNY) personnel who were lost. WALL THREE is dedicated to the 23 New York Police Department (NYPD) and 37 Port Authority personnel who were lost. WALL FOUR is dedicated to the 125 lives lost at the Pentagon. Of these lives, 55 were members of the U.S. military, including 33 Navy sailors and 22 Army soldiers. WALL FIVE is dedicated to the 2,460 lives lost by those in the World Trade Centers and the passengers and crew aboard American Airlines Flight 11, United Airlines Flight 175, American Airlines Flight 77, and United Airlines Flight 93.